The popularity of Network-Attached Storage (NAS) systems has fuelled a surge in demand for large capacity hard disk drives. This interest led Western Digital to create the WD Red NAS-optimised family of hard disk drives. Today, we are going to look at the first helium-filled WD Red model – the 10TB WD Red (WD100EFAX) NAS drive! NAS Compatibility – Advanced firmware technology built into every WD Red drive, enables seamless integration, robust data protection and optimal performance for systems operating in NAS and RAID environments. Exclusive NASware 3.0 Technology – WD’s exclusive NASware 3.0 technology further optimizes the WD Red for the NAS environment, allowing the WD Red to support small NAS systems with up to 8 bays! 3D Active Balance Plus – This enhanced dual-plane balance control technology significantly improves the overall drive performance and reliability. Hard drives that are not properly balanced may cause excessive vibration and noise in a multidrive system, reduce the hard drive lifespan, and degrade the performance over time. Enhanced Reliability – With a 35% MTBF improvement over standard desktop drives, the WD Red drive is designed and manufactured to be a more reliable and robust solution. Energy Efficient – Innovative technology reduces power consumption and lowers the operating temperature, resulting in a more reliable and affordable solution for always on 24×7 NAS environments. Premium Support – Exclusively for WD Red drive customers, a free dedicated 24/7 support line is available in English. Other regional support hours vary. Longer Warranty Coverage – The WD Red drive is backed by a 3-year limited warranty for greater peace of mind. Now, let’s check out the 10TB WD Red (Lowest Price) hard disk drive! 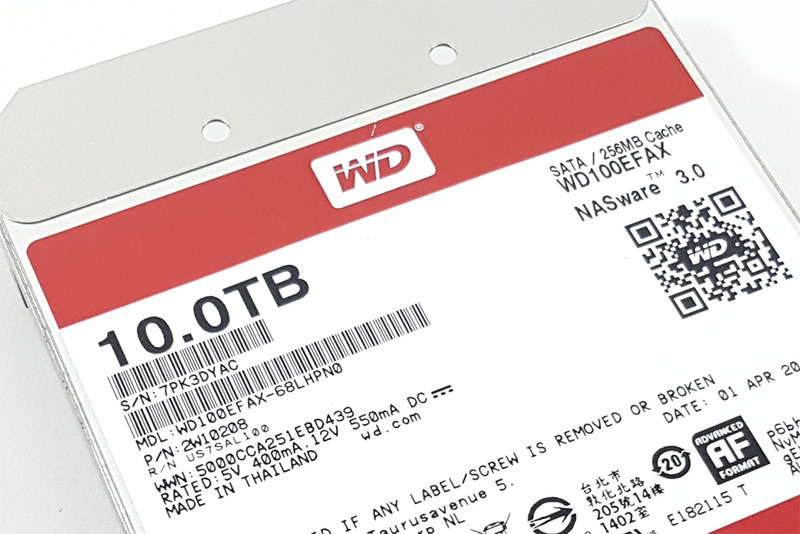 The 10TB WD Red (Lowest Price) hard disk drive came in a sealed antistatic plastic pack. Notably, it lacked the usual sachet of desiccants. That’s because the drive is hermetically-sealed in the factory, and filled with helium. Also notable is their use of two gold-coloured screws to lock the PCB in place. To remove the drive, just tear off the top or cut it open, and slide out the drive. Be sure to ground yourself before removing and handling the hard disk drive as static can damage it. In particular, you should try to avoid touching the exposed PCB located on the lower underside of the drive.